I understand the message this picture is trying to convey. It's simple, cyclist have the same rights as our motor vehicle friends... but how many of us cyclists practice what we preach? How many of us have blown through a red light, or rolled through a stop sign, or better yet blocked in a poor motorist while in a large group ride? 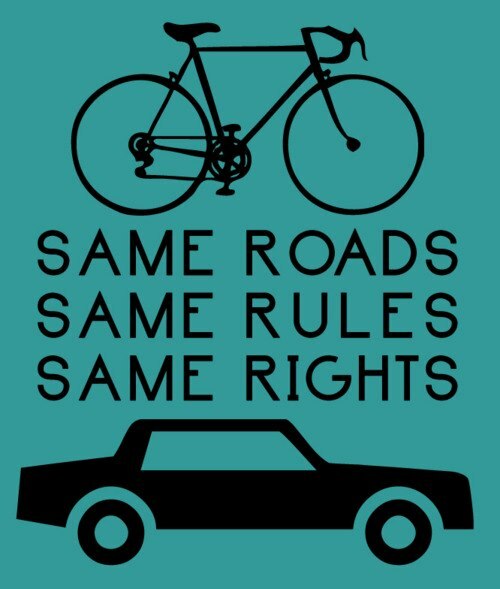 The words in this picture should be swapped and messaging to cyclists should read, "Same Roads, Same Rights, SAME RULES"
Power is in numbers and I've been on plenty of group rides where "we cyclists" believe the rules not apply to us as we make our way down the road. So I guess my point is, I understand the message, but as cyclists, it's also important to practice what we preach.